Sierraform GT Momentum is made up of small uniform granules, allowing for even spreading and fast application. It comes equipped with ICL’s patented MU2 and SilK coating technologies. 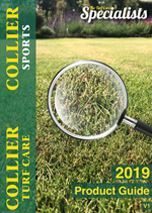 Its 4:1:2 ratio meets turf nutritional requirements and is ideal to use during active growth periods from spring to summer. Momentum contains slow-release nitrogen and potassium, phosphorus, magnesium, and trace elements. Magnesium enhances turf colour while the trace element package ensures maximum health. It is particularly suitable for use on fine turf areas.